When the different Grands Crus of Alsace where delimited, one criterion was that they should be pretty homogeneous in a geological sense. Every Grand Cru is supposed to have a defined and distinctive character. 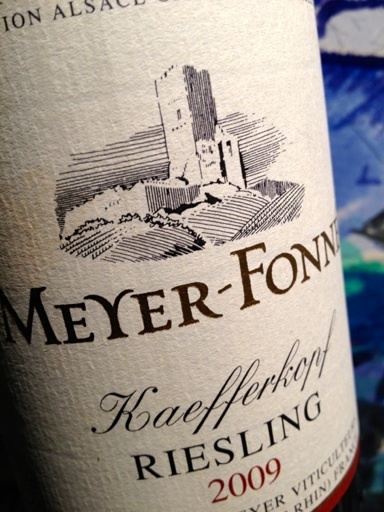 Maybe that was why Kaefferkopf was recognized as a Grand Cru as late as 2006, a full 16 years after the previous group of vineyards were elevated. Undoubtably, Kaefferkopf is complex, with three different parts and highly variable geology and microclimate. 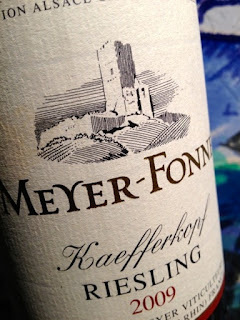 2009 Riesling Grand Cru Kaefferkopf from Meyer-Fonné in Katzenthal is deep yellow. The scent is saturated and fresh with hints of wet stones, smoked pork, orange flowers and light honey tones. The taste is medium-bodied, rich and complex with fantastic acidity and a sandy rough feel in the extremely long finish. A really good and masterful wine from one of the best producers in Alsace. Price: €15.